Which teams and/or strategies seemed to be the most successful in denying points? Especially against powerhouse teams. Ask @Leap. He’s got the A+ strats. Watch matches and you’ll see what good defense is. Some robots that stick out in my mind for defense are 3512 at ventura when they shut down 4414 and 4159 at sfr when they shut us down in semis. Look at what areas of the field these robots generally occupy and how the offense generally responds to that. Then think about how you would respond to their change after they switch their strategy. 4786 and 2830 both had MAD defense at the Wisconsin Regional. It was absolutely insane. Neither of them got yellow carded either or received any penalties either. 5th overall pick at South Florida with just defense and climbing. Some of the best I’ve seen in years. Roebling is in for a nasty surprise. Not to be biased but, 5943 slowed down, and won against, some really strong teams like 2791 and 694 at NY Tech Valley a couple times. The greatest advise Ive heard about defense this year: "You don’t have to be good at defense to be good at defense. Just be in the way, job done." That came from a team with a robot with mecanum wheels. I hate when teams say they can’t play defense because of their drivebases. Can’t be in the way if teams can push you across the field to get you out of their way. Not saying this is always the case, but mecanum wheels definitely make the job less effective. Whenever I think good defense I think of 5012 in semis at Orange County, 747 at mrcmp (there’s a reason why they were first picked by 225, even when 225 had access to good scoring robots), and ofc the classic 1817. I’ll 2nd 3512 being a monster at defense. We designed our whole robot to deal with defense and keep scoring, it sort of worked against 3512 but they still smashed us up good! At our ranking position, 3512 was going to be our first pick over other scoring robots. Both of their regionals were plagued with the whole fouling fiasco when they were really just playing standard defense expected in FRC. 2830 was key in the winning alliance’s victory at Midwest. These guys did pretty dang swell as well. Shout out to 5842 for serving in the same role in Pittsburgh. Can’t be in the way if teams can push you across the field to get you out of their way. if theyre taking the time to push, thats time away from scoring. If you want to see some mecanum defense, check out my team, 3630, at the Northern Lights playoffs. Especially this hit. Honestly? Just occupy chokepoints on the field and deny access in/out of main zones. This game actually does not have the most room to move around by the scoring zones (how many robots usually can hang out around the rocket and cargo ship? 2 tends to feel like a tight squeeze) - make it as hard as possible for teams, particularly the highest scoring ones, to get TO the objectives and to get BACK to the game piece zones. Not to shamelessly plug my own teams, but as @Shelby_Lamp mentioned, 4159 was fairly decent at passively occupying specific zones that were the most “direct” for the opposing alliances to get to (Either by robot starting position or by line of sight from the driver station). 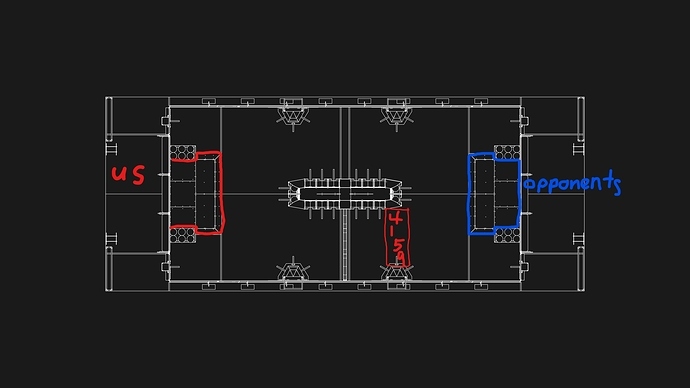 Immediately after watching OCR we starting drafting up what our basic defensive plays would look like - if you watch our eliminations matches at SFR, most of our defense works around a simple robot positioning (roughly depicted below, imagine our bot moving along the box labeled “4159”). We rarely detract from staying in this zone as it either traps our opponents without a game piece at their cargo ship/rocket after scoring, or prevents them from scoring if they have game pieces to place. Super simple, easy enough to expand upon. 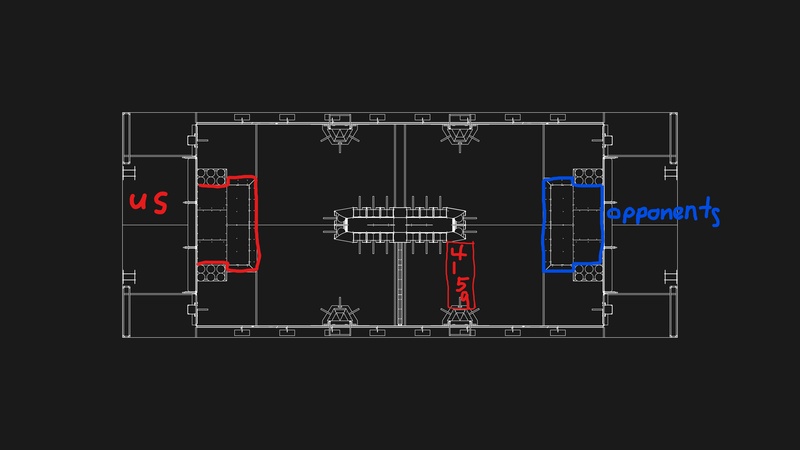 It’s really quite similar to the drawing above but requires a team to be more active about their defense rather than holding down the fort in one specific area. Hopefully we see a lot more of this at Houston! For reference on how effective they were, 694 was the robot with the highest OPR at the event, with component contributions of 4.30 hatch panels and 3.95 cargo. 7308 held them to a combined total of 2 cargo in teleop in the semifinals matches.